Bank of Japan downgrades inflation forecasts, hurting the yen. US Treasury yields retreated from daily highs but held into positive ground. The USD/JPY pair attempted to extend its rally but faltered around the 110.00 figure, giving up early gains and settling around 109.50. The early rally was backed by an improved market mood that implied a strong opening On Wall Street, as speculative interest was pricing in chances of progress in the trade war front after the White House said that their team remains in touch in preparation for high-level talks with Vice Premier Liu He. Government bond yields rose ahead of the opening, with the benchmark yield for the 10-year Treasury note hitting 2.78% before retreating some. The yen fell out of the market's favor after the BOJ downgraded again its inflation forecast, down to 0.9% for the current fiscal year from a previous estimate of 1.4%. In the data front, Japan's December trade balance posted a larger-than-expected deficit of ¥55.3B, with exports down 3.8% and imports up 1.9%. For 2018, the Japanese trade balance fell into the red for the first time in three years. During the upcoming Asian session, the preliminary January Nikkei Manufacturing PMI will be out, previously at 52.6, while later in the day the country will release the final reading of the November, Leading Economic Index and the Coincident Index. The pair has made the first test of the critical 110.00 figure, now offering a neutral stance in the short-term, which means that bulls haven't yet given up, but rather retreated ahead of another opportunity. 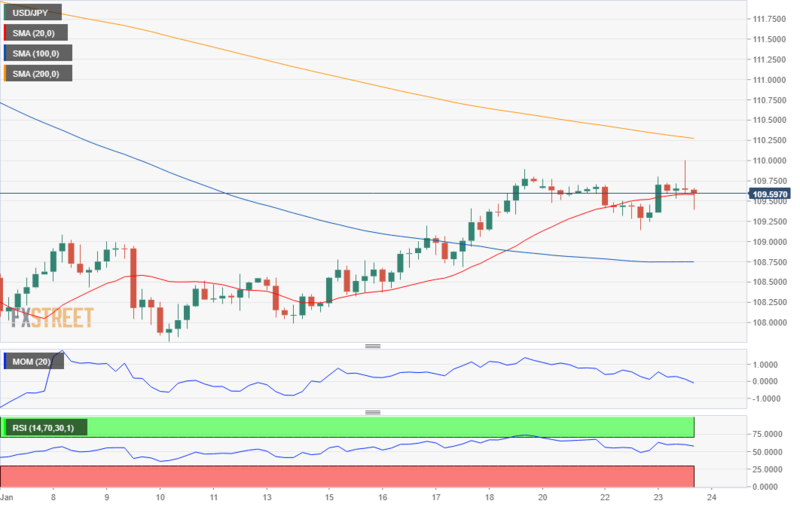 In the 4 hours chart, the pair is midway between the 100 and 200 SMA, both with modest downward slopes, while the Momentum indicator hovers around its mid-line and the RSI indicator turned lower, now at 52. The risk is skewed to the upside as long as the price holds above 109.05.